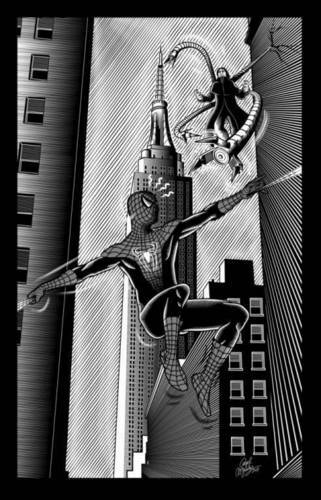 Spiderman vs. Doc Ock. I´m a big fã of the old Marvel comics and in special from Spiderman...So, I have drawn a small fanart from the spider!In the background you can see the empire State Building in New York.... HD Wallpaper and background images in the Spider-Man club tagged: spiderman doc ock spiderman 3 spider-man. This Spider-Man fan art might contain vedação de arame, cerca chainlink, and cerca de arame farpado.